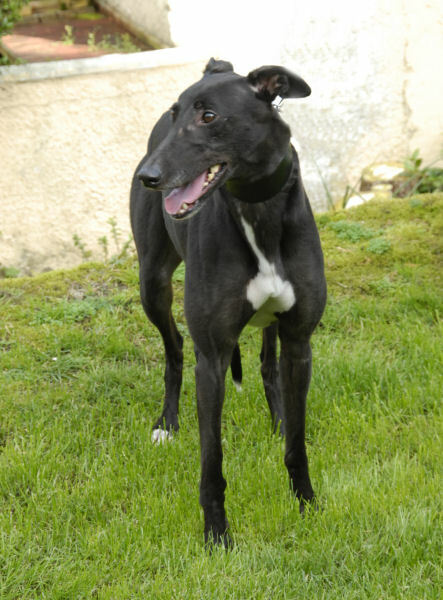 Nicole is a lovely ex-racing Greyhound who was born on the 11th June 2007 and is house trained, spayed, inoculated and microchipped. Before coming to us Nicole was cat tested on a couple of occasions and was deemed cat friendly, however, since being in her foster home she has show curiosuity about everything she sees in the big outside world. In view of this we have cat tested her twice since. 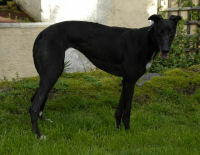 Although she has been tested as cat friendly we would lable her more as cat trainable in that she isn't the type of dog to see a cat and immediately ignore it as are some that we get, but she showed interest and curiosity only to leave the cat alone when told to 'leave' and sprayed with water. At this point she would walk away and ignore it. Nicole, therefore might take more than a few days to be come accustomed to living with a cat, but with the right people and set-up ie: safety gates, then she would be fine and would get there. She walks nicely on the lead, travels well in the car and from what we have seen so far is alright with other breeds of dogs. This morning Stuart collected two new greyhounds, one of which was Nicole. 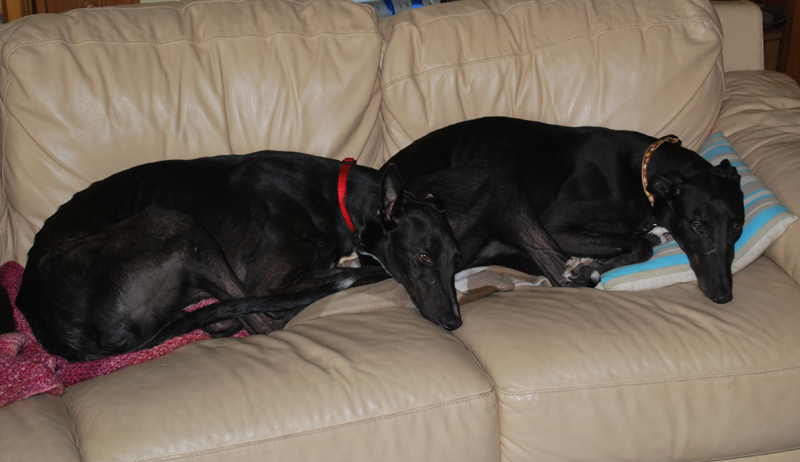 They both travelled well in the car and met our greyhounds with no problems. Having walked them both around our garden so they could do their toilet we then took some photographs of them, then brought them into the house. When Julia arrived she took Nicole home with her to foster while we kept May. We received an email from Julia this morning letting us know that Nicole is great and they love her. She was snuggling up on her daughter's bed last night with a wonderful smile so her daughter was trying to copy her and the more everyone laughed the more Nicole loved the attention. Nicole is quite nervous of her new surroundings and as soon as Julia moves off a chair or out of a room she follows her. This is insecurity and will stop in time. Because Nicole is going to live with a family who work she will need to be on her own at times so Julia has started keeping her upstairs in the lounge with the stair gate for odd times, while she goes downstairs to the kitchen to do work, which should help her get used to being on her own. Yesterday she left her for half an hour while she went to get her daughter from school. Her son was downstairs and said she seemed okay. She pulls a bit on the lead, but this again is nerves at being in new surroundings and will stop once she settles. She met 2 collie dogs this morning and was very social with them. Julia put her muzzle on but she was fine. At the moment she is very greedy with food and gets very excited when Julia is making anything in the kitchen. This will be because she's not seen any food in the kennel other than the food she is given and, in some kennels, its the quick and the hungry who get the food while those who don't push in go hungry so they soon learn to gobble things down - this again is something we've seen before and stops once they get used to seeing food around, being taught to LEAVE and realise that no one is going to steal their food. Nicole was givne a big rawhide chew this morning and it kept her very busy as she never moved from her bed since she got it. Julia decided to give her one after she found she had chewed a pencil while she was downstairs! Everything around the house made her jumpy at first including the sound from the television, flushing the toilet, hoover, hairdryer, which are all new noises to her. She is fascinated with mirrors, probably thinks its another dog looking at her! 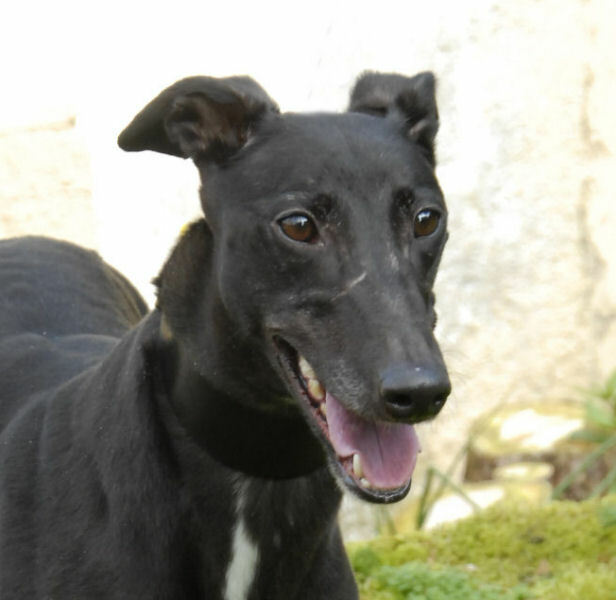 Having said all this Julia says she is a very friendly, cuddly girl who will come on in leaps and bounds as she settles. She loves a cuddle, sofas and beds. We received an email late afternoon letting us know that although Nicole has been cat tested and is going to her new home tomorrow Julia is a bit concerned at an incident that happened today. As the weather was good she had the back door open and her cats, who don't come in the house but sleep in the shed where they prefer were asleep in the sun on the next door neighbour's oil tank. Where they were laying they can be seen from Julia's garden but the dogs can't get them. Nicole upon spotting them attempted many ways to get a good look at them and get close to them. You can see them clearly from the top of the garden but not from other parts and this has been Nicole's dilema! To see them she had even tried to balance on the domed lid of the sandpit to get a better view of them and has been the only dog to jump from the wall that divides the upper and lower parts of the garden, little monkey! After a couple of hours the cats, who couldn't care less about Nicole's antics went elsewhere and Nicole came in the house and settled. Upon hearing this we decided we must cat test Nicole ourselves, contacted a lady we know who has three cats and lets us take dogs in and phoned Nicole's potential owner to delay them coming to collect her until the test had been carried out. past as she was to be away all day and we were going to cat test Nicole and either home her or not depending upon how she was with cats. Shortly after she arrived we took her to be introduced to two cats. With lead and muzzle on and water spray in our hand she was introduced to them. Upon seeing them there was interest or more likely curiosity because being told to 'Leave', a water squirt and the cat hissing at her she backed away and after that showed little interest until it moved. Another 'Leave' and she stopped. Nicole is not one of these dogs who is scared of cats or shows indifference, because she is curious, so with Nicole she would need introducing to a family cat with muzzle on and water spray in hand and allowed to get to know them in a 'controlled' environment over a few days. Having said this, this is what we strongly advise all cat owners do who introduce a new dog to the family - no matter what the breed! Upon discovering Nicole was cat friendly we contacted her potential owners to let them know they can come and collect her to be told they'd had second thoughts and decided not to get a dog while they had the cat. What a shame, but at least we discovered this before she went, which would mean she would have been returned because without a positive attitude there is always a return. Hearing this news we phoned Julia to let her know Nicole wasn't going to her new home and could she collect her on her return, but she wasn't going to be home till late so we thought it best Nicole stayed with us the night and be collected in the morning. 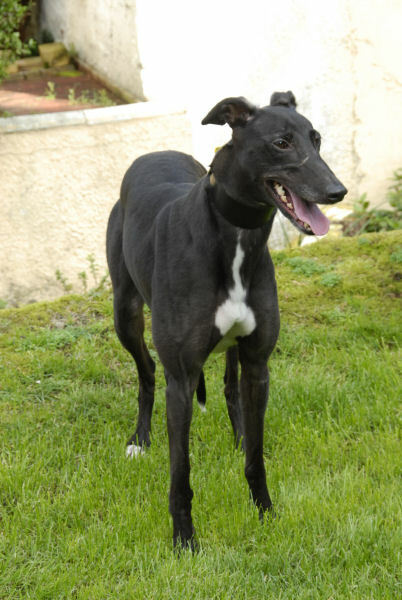 Nicole quickly settled with the other greyhounds, ate her tea, enjoyed her walk then settled down for the night. Nicole settled well last night and this morning went out with the others before settling in the living room while we did the bed and breakfast guests their breakfasts. Once all finished and cleared away all the dogs came out, had a run around the garden, ate their breakfast and settled to their beds. When Julia arrived they all gave her a lovely welcome including Nicole who when the time came to leave happily walked out with her to her car and off home. Nicole has been pulling quite a lot on the lead since the weekend so she thought she would take her out for a run as it was such a lovely day. She took the dogs down the old railway line at, where the fields are owned by friends. There is a wonderful huge flat field down there and today it had no sheep so Julia let Nicole have a run. She loved it. Shane, Julia's lurcher wanted to play but Nicole wasn't bothered. She was very interested in all the animal smells and she checked all the fences near where we were. The field is huge and once to the end and back she stayed within about 10 meters of Julia. Julia called the dogs back and Nicole came with hers and she put her lead back on and gave her a biscuit. They carried on with their walk and on the way back they passed the field again and because it has a gate at both ends they went in one end and Julia let Nicole off and they walked towards the second gate. This time she was a tinker to call back, she knew Julia wanted her and she came back but not close enough to get hold of her collar. Julia remembered from dog training once when Shane ran off across the park at agility training, the trainer saying to turn and walk in the opposite direction and they will follow. She did this several times and each time Nicole came to her, but still not close enough. Julia's dogs knew it was biscuit time as they had been called and were getting so confused. Julia thought to herself, "well, I have all day to do this" and next time Nicole walked right up to her. She was praised and given a biscuit, but any opening in that fence and Julia thinks she would have been off! Back home she fell fast asleep, but future owners need to be careful of where they let her off until they are certain they are 100% sure she will come back to them. We received an email today from Julia letting us know that Nicole is finding her feet on their walks. She is very good on the lead when they are walking on the road anywhere, but once they set off across the fells or through the woods she is on alert for anything that moves, with her head up checking everything and occasionally eager to set off in pursuit of something. Julia has started putting a halti headcollar on her when walking across the fells with another lead attached and that is brilliant. She is so easy to hold that way, and she seems not to pull so much when she has that on. Julia feels happier with that on knowing she can hold her if she suddenly sees something she wants to chase. She is so inquisitive. Nicole is brilliant in the house and sometimes plays tug of war with Shane. At the moment Nicole is going through a phase of shredding paper, dolls hair and egg boxes to name a few items. She loves hunting flies in the house, and as soon as she hears one she is on the prowl and rarely gives in until she's caught it. We took Nicole for another cat test today and we believe she is cat friendly, which we've found difficult to check in the past because she was unsettled in a strange place, which shadowed how she truly was with cats. This lunch time Nicole arrived to stay with us a couple of days while Julia was away. She'd taken Jasper and her two dogs with her, but thought four too many so Nicole is with us for a while. Nicole has been here before, but when all the others came to say hello she had an accident on the floor, which was a nervous reaction to being overpowered by the others. After she was no longer center of attention she relaxed, but when Stuart arrived back with the shopping later in the afternoon and all the other dogs ran to greet him she stood back at the other end of the room and had another little accident. After that she settled and having ate her tea and going in the garden we found her fast asleep on one of the easy chairs in the living room. From all the things that Julia has told us about Nicole and from what we've seen, we feel she is a very sweet natured and loveable little girl who is curious yet rather nervous in new situations or where there is a lot going on. This we believe will settle in time as she becomes more used to the comings and goings of the 'big outside world'. We received an email from Julia this afternoon saying that either Nicole or Jasper has learned how to open her kitchen cupboards. When she was out yesterday they raided the cupboard of dog chews, breadsticks, kitkats and rice cakes! It happened the day before too but Julia thought maybe someone hadn't closed the door properly. The door is now tied with an elastic band!! The random eating however had adverse effects on one of their stomachs because last night there was a sloppy poo on the kitchen floor, which was paddled all over the place during the night. Not a good start to the day and she's not sure who it was. All seem fine now and she took them for a long walk later. We received an email today from Julia saying yesterday the wind had blown the gate shut to the raised grass section in her garden, however she noticed Nicole was on the grass. Today after already having two accidents in the house, one just as Julia got up and the second as they walked back in the house from their walk. She let her back in the garden and again the wind had blown the gate shut. Julia watched Nicole and she did a standing jump on to the 3'7" wall and up onto the grass!!!! This is the same dog who rarely jumps into the car and has to be lifted!! Just hoping now she doesn't jump the side wall which is the same height. She will only get into next door's wilderness which is fenced in so Julia shouldn't lose her for too long if she does jump that way. She is certainly a bit of a character, but Julia can't work out her accidents though. Some days she doesn't do any, while others it can be up to six. Most days here have the same routine so she is not sure what makes her do them. Julia is going to keep a note of her accidents and what is happening at the time to see if she can get to the bottom of it. Julia said Nicole had three accidents yesterday. One when she woke up, the second was when Julia came back in after helping with swimming at the school. Nicole had already done it by the time she got up the stairs and the third was while they were watching TV. She just came in the lounge and started doing it. Julia growled at her and she ran off so she went after her and put her outside. There wasn't any reason Julia can think of to do it the last time, not as if she was walking to the door. She knew why she had growled at her. We received a phone call this morning from Julia saying Nicole had a 'nick' on her face. All the dogs were in the back of her car as usual and one stood on Nicole and Nicole retaliated to find one of the others objected and she received a 'nick' in her face as a result. As she wasn't sure whether it required vet treatment or not she brought her round for us to take a look. It was border line, but it being a bite and on her face we decided to let the vet have a look at it. As Julia had an apointment at lunchtime Nicole stayed here and we took her to the vet in the afternoon. The vet kept her in and put a couple of stitches in it because as she said, with it being on her face it would take ages to heal and leave a scar. With her having one scar already it wasn't good to have another. By inserting stitches it would heal quicker and leave no scar and the antibiotics were advisable to fight infection with it being a bite. Later that afternoon we collected her and she stayed with us until Julia called to take her home. We received an email this afternoon from Julia letting us know that Nicole seems fine. Her stitches are looking good and she ate her antibiotic tablet in her food with no bother. She is currently fast asleep after a very windy, but not wet, walk. We received an email this morning from Julia letting us know that Nicole's face is looking fine after the little nip that require a couple of stitches. Her antibiotic tablets are being eaten each time and tonight it was hidden in some chicken so it was the first bit to be eaten. Julia bought some Kong tennis balls today which have a squeaker in and Nicole and Shane, Julia's other dog think they are great fun. This morning she was tossing a stuffed toy in the air and catching it for a few minutes, which was funny to watch. No more accidents in the house!! Nicole's new owners arrived at lunch time a few minutes before Julia brought her here. She gave them a lovely welcome and after all the adoption paperwork was complete and we gave them her remaining antibiotic tablets she needed. She never has been very good at jumping in the back of vehicles so we showed her new owners the best way to 'give her a leg up' and once in off she went with them to her new home where we hope she has a long and happy life.